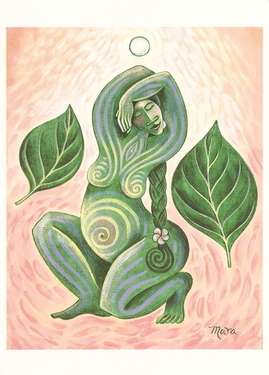 According to the book “The Woman’s Wheel of Life” this phase of life includes at least three archetypes: The Lover, The Mother, and The Midwife. The Lover is drawn to falling in love and partnering with a mate. Love kindles our essence of being; we can’t control its prompting or its course. Learning to work with the fire of our sexuality is one of the directives of this phase of life. Any time of life we are drawn by our passions to create–whether to bring forth a child, a work of art or to manifest our “calling” –the lover is alive in us, calling forth our creative energies. The Mother is in an intense period of nurturing. She meets the Great Creatrix and merges with the divine matrix of life through the second Blood Mystery of childbirth. The prime lesson of this Blood Mystery regards surrender and control; it is the paradoxical discovery that only by letting go do we gain mastery. For women who choose not to (or cannot) have children, this is learned with the first fully passionate commitment to a creative work, particularly if the only way to complete it runs through uncharted territory. Birthing give us an opportunity to stand at the gateway or portal between worlds and learn beyond forgetting the ultimate source of our power and creativity. 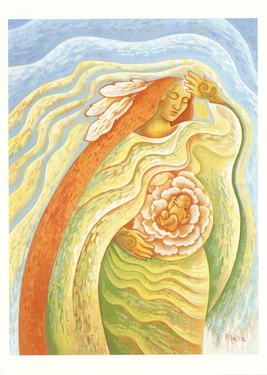 The stage of The Midwife may be otherwise known as that of the teacher/facilitator, she who has known firsthand the transformation of birth (whether it be the birth of a baby or her own unique self) and is now ready to help others through the same process. At Sacred Groves Therese honors and pampers those who are in the mothering stage of life, nurturing young children, , by offering her famous “Earth Mothers Spa” services to women who are in the mothering years. This year it will be offered during the week after Mothers Day, by appointment.. Contact Therese if interested. Therese also facilitates Birth Blessing rituals and rituals to honor and welcome a newborn baby. She is also available for one-to-one counseling to pregnant women to prepare for the birth. Contact Therese for more details. Link to Therese’s daughter’s site: Offbeat Mama.